ISO 9001:2015 Certification is a Big Deal! Quality matters to us. Customer satisfaction is huge. For years, our tag line has read, “Your success is our passion” – and we mean it! Over the last year, we worked our tails off during the intense process of achieving ISO 9001:2015 Certification and now we are proud to announce that our hard work has paid off. Through a rigorous year-long process of intensive auditing, L-Tron has demonstrated that the product and service expectations of customers are being met, as defined by the strict organizational standards set by the International Organization for Standardization (ISO). These quality standards are used and recognized by millions of businesses and organizations worldwide. 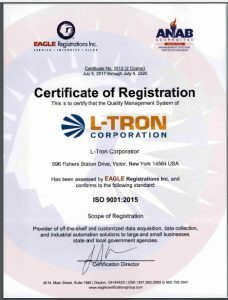 ISO Certification reaffirms that L-Tron is highly devoted to its customers and demonstrates its commitment and credibility through quality management and assurance, as well as a continuously evolving approach to critical processes. With ISO Certification, we are able to maintain a positive company culture and employee morale, in which invested employees deliver a quality experience. What does the L-Tron “C-Suite” have to say? RAD DeRose, Partner and CEO, explains how ISO Certification prepares L-Tron for future growth and makes the Company a more valuable business partner. Job well done, L-Tron team!